Sometimes you feel light and happy, but the weather outside does not reflect your mood, and then you have to take matters into your own hands. Maybe you turn up the music and dance into oblivion all by yourself. Perhaps you watch a very funny movie, or curl up on a couch with a very good book. Or maybe your mind wanders into the creativity zone and you write a book, paint or maybe cook? What do you do on a gloomy day, when you yourself don’t feel gloomy at all? I do all of the above, I dance and watch a movie and read, sometimes I paint, sometimes I cook. Cooking, you see, is the fastest way I can can dip into my creativity, it comes naturally for me. I enjoy both the science and the art behind it. Lately my cooking experiments had me delve into the quinoa and mushroom zone. I made variations of quinoa and mushroom “quinotto” for months trying different varieties of mushrooms and quinoa, adding broth, wine, different vegetables, herbs, cheeses. When I got tired of the “plain” quinoa and mushrooms I started on a quest to use them as a stuffing. Last week I stuffed chicken breasts with quinotto and dried porcini mushrooms for and event, and it was a huge hit. 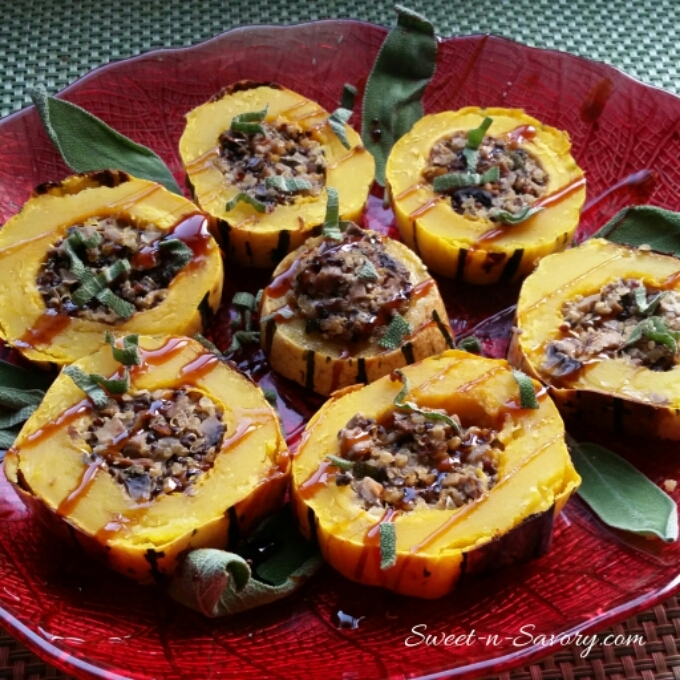 Yesterday I stuffed a squash with mixture of mushrooms, onions, garlic, sage and quinoa. My main goal was to create a dish that was both delicious, nutritious and friendly to someone who watches their weight and works out a lot. The beauty of this recipe is that it’s elegant in it’s simplicity as well as a nutritional powerhouse with loads of vitamins, minerals, combining good carbs, fiber and good fats while also offering a complete protein. You can have it as a pre or post workout snack, or it can be served either as an appetizer or a side dish for a Thanksgiving Dinner drizzled with some cranberry orange sauce. It’s so delicious , that my husband liked it, and my husband and squash don’t go together in one sentence. Because you see, something magical happens when you take a forkful of the sunny flesh with some stuffing. The mellow sweetness of the squash will melt on your tongue combining in perfect symbiosis with the earthiness of the stuffing. Do add a little balsamic glaze or a cranberry and orange sauce to your bite, they add a touch of acidity to the dish to bind that perfect bite together. Come on try it, I won’t stop you. 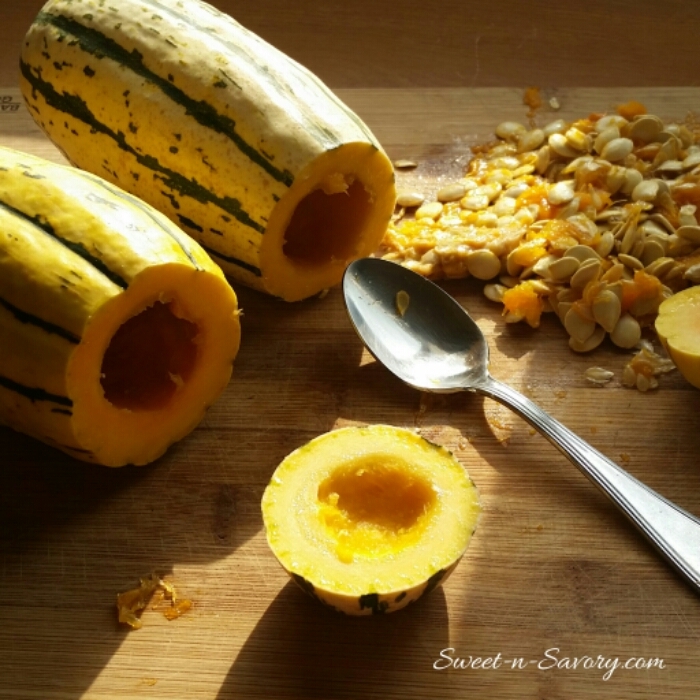 Wash and remove the seeds from the delicatta squash. You can wash and dry the seeds to munch or sprout them to add to salads. Over medium flame, heat oil and ghee in a medium sauce pan. Add onions and saute until the onions are transluscent. 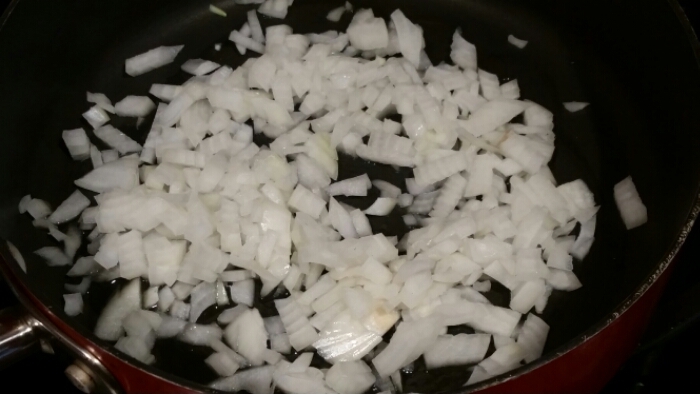 Add garlic and mix together, cook for about one minute or until garlic is pleasantly fragrant. 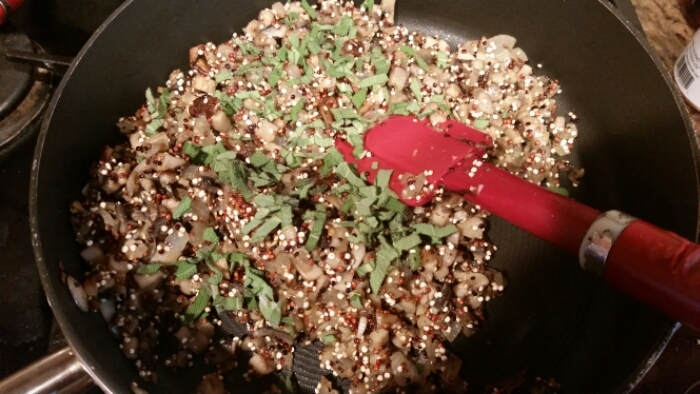 Add quinoa to the mushroom mixture, cook together for about 3 minutes. Season the mixture with salt, pepper and herbs. Add your liquid, and cook covered until quinoa is done and germ separates. 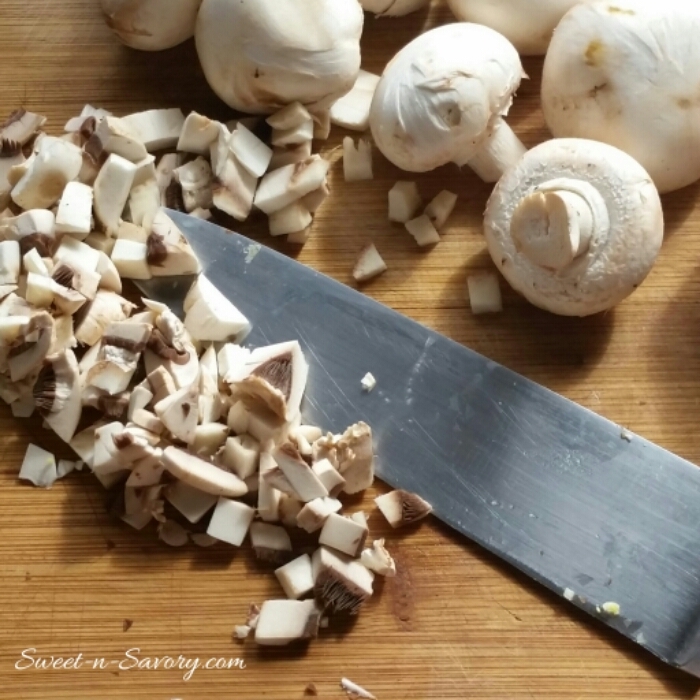 Once the mushroom mixture is cooled, add a whisked egg to mushrooms and stuff the squash. 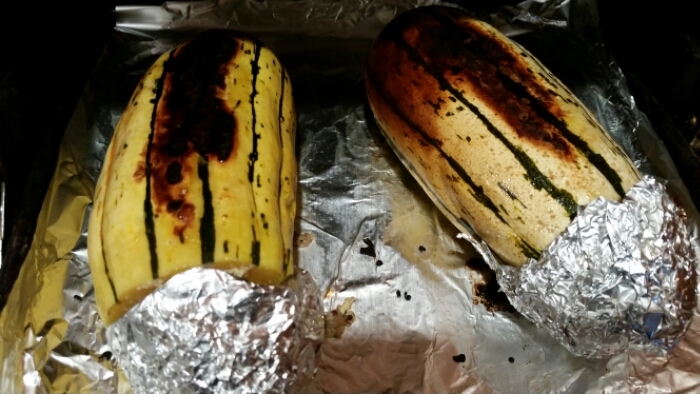 Bake in a preheated to 375 F (190 C) oven, for 30-40 minutes or until the squash is soft to the touch, be careful to not overcook it. Cut intothe medalions, drizzle with the balsamic glaze.